The story telling thrust of the season narrative could be palpably felt shifting into the next gear in, ‘Subject 9.’ Gone are the hand holding moments from the previous episodes for new viewers. A most excellent episode filled with several WOW(Wonderful Olivia & Walter) moments as Walter is driven to prove his worth by stepping out of the lab for the first time in three years. This subplot was designed for character moments; all journey versus destination, its true intent never about being a source of story tension. Olivia’s decision going for or against Walter was never in question. The rewards in the St. Claires subplot were in the bonding moments that the story journey presented. And what a delight it was to see Olivia and Walter forge bonds between them that never were possible in a universe where Peter Bishop had existed. John Noble was brilliant, as always. 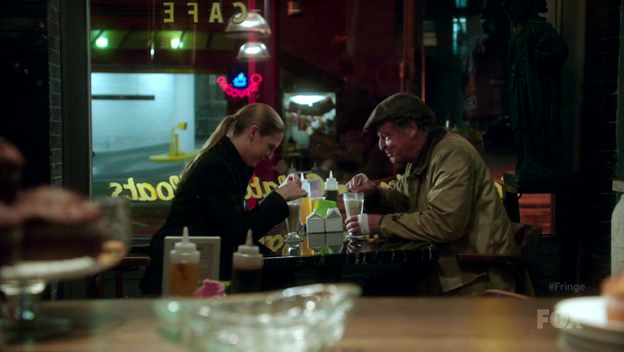 The real treat was seeing Anna Torv going toe to toe with John Noble and matching his acting prowess at every turn. A visible demonstration of her growth as an actor from the first season on. The hand bandaging and how to properly drink a Root Beer Float scenes were the highlights. All these W.O.W. moments led to, along with her decision to stop Mark Little from destroying the BBL(Blue Ball of Light) based on her feelings rather than logic, Olivia deciding in Walter’s favor. There is understandable indecision about which parts of the new timeline to invest in. The possibility for everything in this season to be tossed away once the inevitable timeline correction occurs hangs in the background. The general rule of thumb I am operating on is that the things the series shows us will stick such as the new Walter and Olivia relationship dynamics. Other things like Olivia running away from the Cortexiphan trials, Olivia having a more developed relationship with Nina, etc; anything we are told about – are akin to candy sprinkles on an Alternate Universe cake. Nice to think about but not ultimately necessary to support the story going forward. who is Broyle’s mystery boss? Peter is back! But no one remembers him. Peter is back and thankfully the Fringe showrunners, as expected, avoided the easy way out. They did not jettison any timelines. Peter still retains his knowledge of the previous seasons. But no one else knows him. 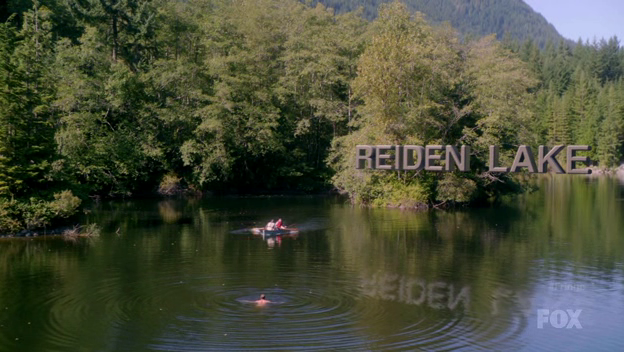 This is a flip of Season Two where everyone knew about Peter being from the Other Side before he did. This time it is just Peter and the audience who know about the secret of Season 4. If there is anything different about this episode I would have wished for, it would have been September being actively involved in helping Peter cross over. This moment was a great opportunity to get the Observers actively involved in the story line. Where does the show go from here in respect to the two timelines? Will one replace the other? Or will the two be merged in some way? Could the resolution of that story line lie in a Cause and Effect story line? Peter’s attempts to cross over generated Time Distortions. Are those distortions over for good? Or has Peter repeated the actions of his father, whose own crossing over cause a rift in the Laws of Reality? Peter may very well find himself in his father’s shoes if the Time Distortions continue to manifest themselves. And how will Peter respond to such a scenario if it does happen? All that he has endured will be for naught if Time unravels. So many exciting directions the show can go ahead with now. Which one, we will find out in two weeks when Fringe returns. But man, oh, man that, ‘Novation,’ preview is irresistibly rewatchable. The show continues it’s exploration of what a world without Peter is like and its impact on those he left behind. Till this episode that journey has been an interesting one with the success of the journey relying heavily on how interesting the case of the week is. In my books translucent shape shifters and serial killers trump killer fungus any day. ‘Gus’ was too flat a threat to get very excited about. Pity too because John Noble acted the heck out of the episode. 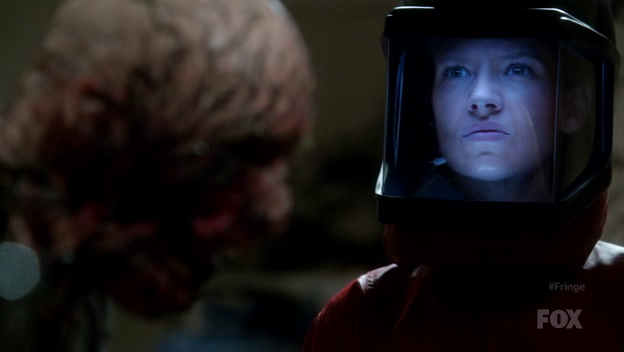 So did Anna Torv – when she could break away from the case of the week imposition. Special marks for Jesika Nicole too. 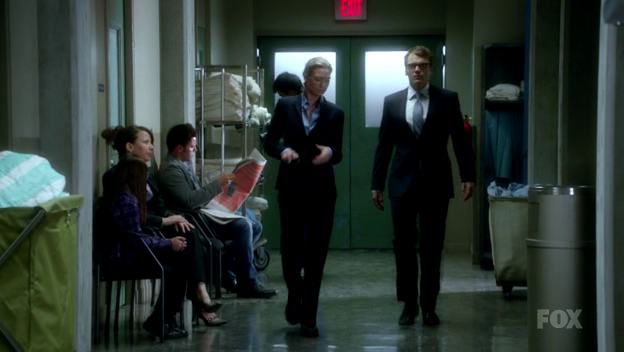 Oddly enough on our last FBI – Fringe Benefits Inc podcast, (which you can find under the Podcast tab here at FringeTV), we remarked it was curious that Peter was only trying to contact Walter and not Olivia. The previous two episodes had a definite lack of Walter and we hoped for more of him. Both of these items were addressed in this episode. 2 for 1 His ‘N Hers Suit Sale? One quite successfully. The other not so. John Noble was amazing, as always, in every scene he had. From the interview with Dr. Sumner, his apparent breakdown in front of Broyles, his scenes with Aaron, and the coups de grâce; his final anguished moments driven to deliver a self administered prefrontal lobotomy. So tortured is Walter and so afraid of being sent back to St. Claire’s Mental Hospital, he undertakes this radical procedure in hopes of ridding himself of his ‘hallucinations’ rather than return to being institutionalized. That final scene as Walter and Olivia shared their secrets was wonderfully played by both Noble and Torv. Between that and Noble’s performance through out the episode, ‘Alone In The World,’ is a worthy viewing experience. Where the episode fell flat was pretty well anything to do with the case of the week plus Olivia and Lincoln. No doubt the intent was to show through their dress code and glass ware choices how alike Olivia and Lincoln are but in doing so the episode diminished Olivia throughout. During the case Lincoln was making the observations and insights that Olivia always did before. Hopefully, this is a short term issue that goes away once Peter returns. Lincoln should be paired up with Astrid and Olivia with Peter to allow the best mix of differing character types. What really bothered me this episode was the conceit that Olivia seemed oblivious to Walter’s deteriorating mental state even though it has been going on for several weeks. It could have flown better if the scene between Olivia and Lincoln in FBI headquarters never happened. Are we really to believe Olivia calls Lincoln in to provide support for a phantom feeling while a very real issue with Walter, that everyone else is privy too, has slipped under her radar? While this Olivia may be more tightly wound up, the conceit that she would keep her Peter dreams to herself while remaining oblivious to Walter’s deteriorating condition runs counter to her observational abilities as an agent and her sensibilities of helping others. ‘Doctors scare me.’ ‘You’ll like Walter.’ uh maybe not. Of course, the reason for Olivia’s delay in comprehension was to save that moment for the last scene but it should have been constructed in a manner that did not diminish Olivia. Now that Walter’s and Olivia’s shared experiences are revealed, the return of Peter cannot be that far away. Given the dynamics of these different, yet so familiar, characters the arrival of a Peter from an alternate timeline will be an interesting one for sure. If you have a green thumb this episode may have played better for you. Sadly, neither of my opposing digits are of that color.